Our amazing building was officially opened in 1914 - in the presence of the last Emperor of Germany, William II - and first used as a house for young single men. 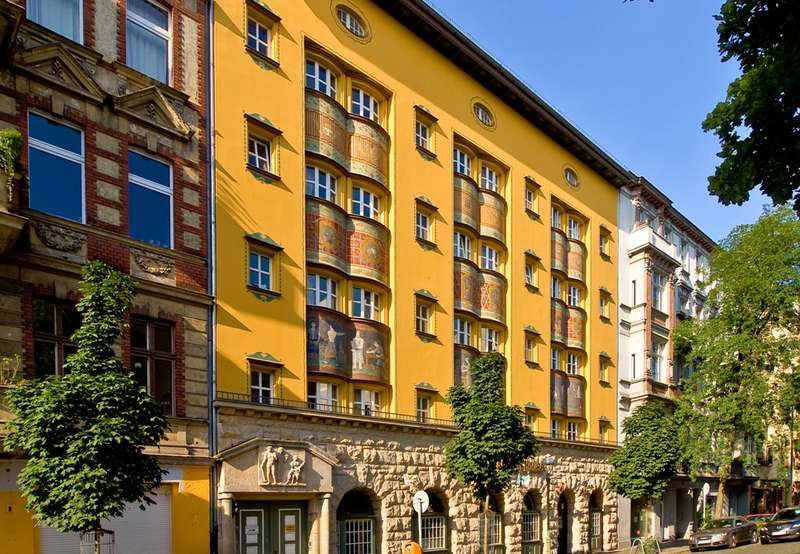 Its impressive façade in Art Nouveau style remains exactly the same and it’s now a city’s historical heritage. The inside building however has been completely renovated and modernized in order to fulfill all our guests’ needs. 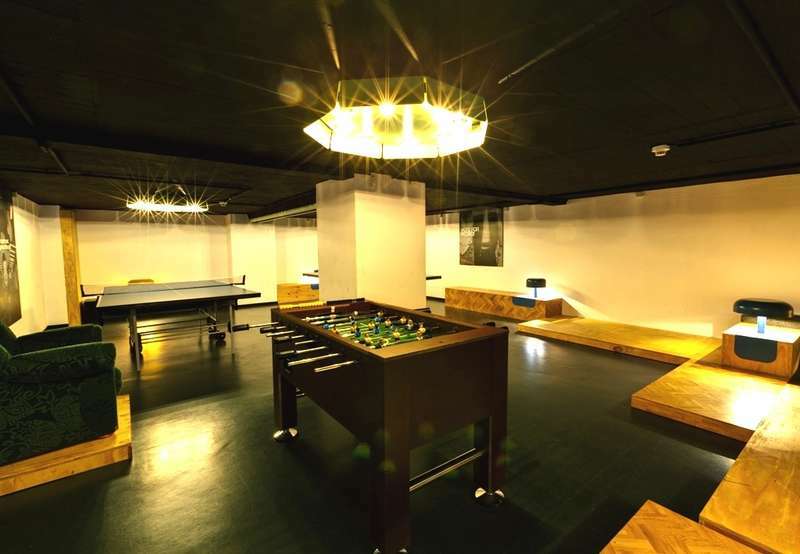 Our great infrastructure offers 24h/7 reception and bar, game room, free internet, bike rent, laundry and tickets services. We provide a diverse range of clean and comfortable accommodation such as dorms, 4bedrooms, family rooms, twin rooms - ensuite or with shared facilities - and single rooms. Our team is at your service 24h/7, whether at the reception to check you in and help you with tourist information, or at the bar serving you the many beer types of our menu. We offer cheap breakfast buffet and all-you-can-eat burger BBQ, free computers and Wi-Fi at the lobby, laundry and tickets service, bike rent, game room, free maps, karaoke and DJs nights, safe, luggage room and much more to ensure your comfort and the supply of all your needs. Hauptbahnhof (Central Station): take the southern exit Washingtonplatz, go across the station forecourt. At the bus stop take the airport bus TXL direction Flughafen Tegel for 2 stops. Get off at the Underground stop Turmstr. Walk on Turmstr. for 3 blocks in the same direction as the bus. Turn right into Bremerstr and than first left into Waldenserstr. The hostel will be on your left in approximately 70m. From Airport Tegel (TXL): take the bus TXL direction S + U Alexander Platz for 4 stops and get off at Underground stop Turmstr. You are right in front of the underground entrance on Alt-Moabit-Str. Cross the small park. Turn left at the Turmstr., than right at the Bremer Straße and right at the Waldenserstr. The hostel will be on your left in approximately 70m. Airport Schoenefeld (SXF): walk to S-Bhf. Flughafen Schoenefeld and take the Metro-Train 'RB 14' direction Bahnhof Zoologischer Garten, get off there and change into Underground U-Bahn line U9 direction Osloer Str. After 2 stops get off at Underground stop Turmstr. Use the exit near top/ head of the train. Turn right, keep following the sidewalk of Turmstr. for 3 blocks going on the church s direction. Turn right into Bremerstr. and than first left into Waldenserstr. The hostel will be on your left in approximately 70m. **DIFFERENT/ SPECIAL CANCELLATION POLICY** New Year 2013/2014 During the New Year’s Eve period from December 27th, 2013 to January 2nd, 2014 reservations with a minimum stay will be accepted, only. Please note that there is no check out on January 1st, 2014. Cancellations announced more than 28 days before arrival are free of charge. Cancellations announced less than 28 days or no shows are charged with the originally booked grand total (100%). Cancellations have to be announced in written form, only (no phone calls!). In case of cancellations with costs, the according fees will be charged to your credit card. By confirming your booking you are accepting to withdraw the grand total prior to arrival (less than 28 days) and these special cancellation terms. All our rooms are equipped with bunk beds, except the Single ensuite and Twin ensuite rooms. At your arrival we take a deposit of 5,00 € in cash for each keycard. Minors must be accompanied by a parent or bring a written authorization of those containing name of parents, number and copy of passport, date of arrival and date of departure. Minors can only stay in private rooms.